Everybody who comes to Myanmar should visit Inle Lake. Although one of the most visited tourist spots in the country, Inle Lake offered us 5 relaxing days that we enjoyed very much. 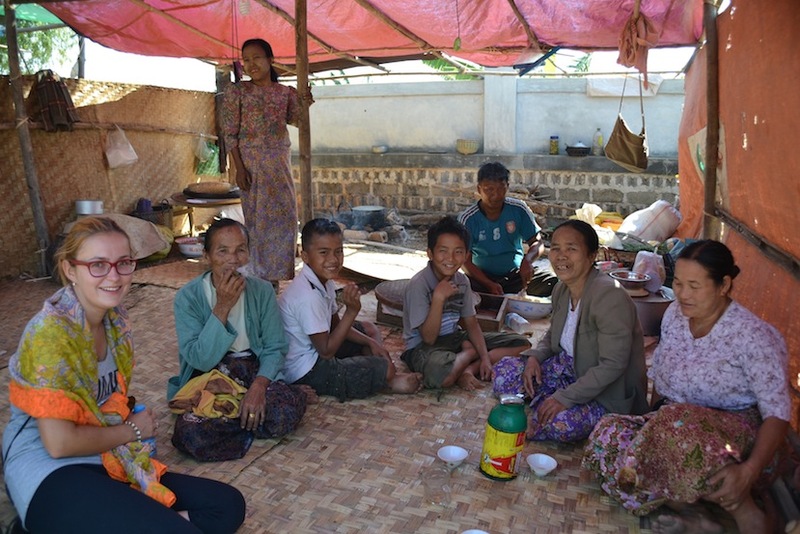 Our as well as most visitors’ choice was to stay in the town of Nyuang Shwe. As we found out on our trips around the lake it is also pretty much the only place for backpackers to stay. Before starting the 3 days trek to here we booked Tripadvisor’s No. 1 guesthouse here – Mingalar Inn – and it did not disappoint us. Apart from other pros of this place, we have got a welcome drink on each of the days of our stay! That is what we call hospitality! After being on the road for almost 6 months and especially in such different places we longed for some ‘western’ food. We were lucky that the town had a french bakery and a few restaurants that made a local take on pizza and pasta. That is where we headed after we arrived. Also we were happy to find out that many local dishes were salads and so we sampled at least one kind every day. Our all-time favourite was avocado salad. 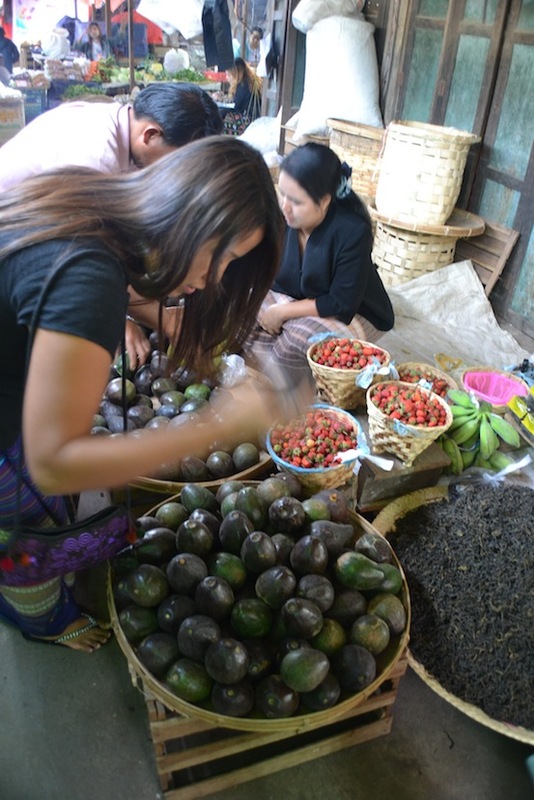 To be fair, the salad is very basic, but the avocados here in Myanmar are the best we ever had. Getting hungry now? Well, we will tease you a bit more. While searching for laundry in our street we spotted a cooking class ad on one of the agencies’ board. Great, finally we can not only tick one of our bucket list items but also learn to make food that not many have tried before. The teacher/cook was leaving for Yangon the next evening, so our only chance was to go first thing in the morning and prepare ourselves hopefully delicious lunch. 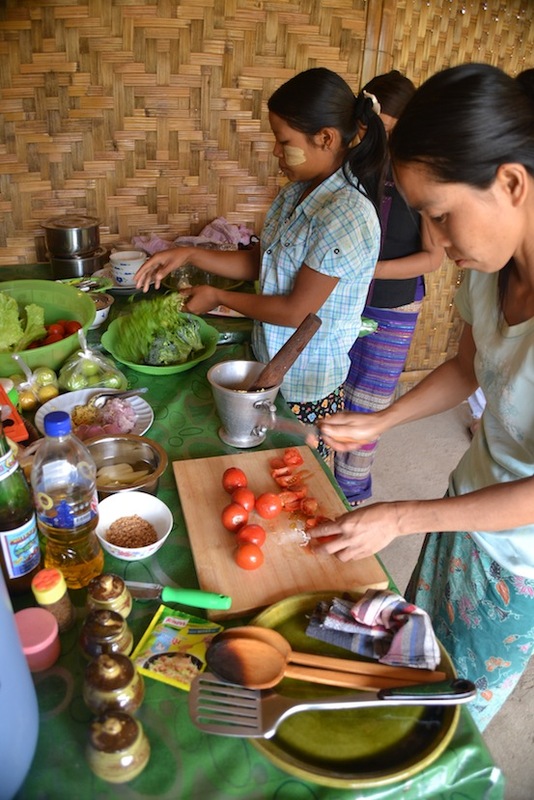 Thu Zar – the cook – came to pick us up at our guesthouse at 9am. Surprisingly she is a young lady with very good English. While walking together towards the local market she explained we will be preparing 9 dishes together but before we have to shop for ingredients. 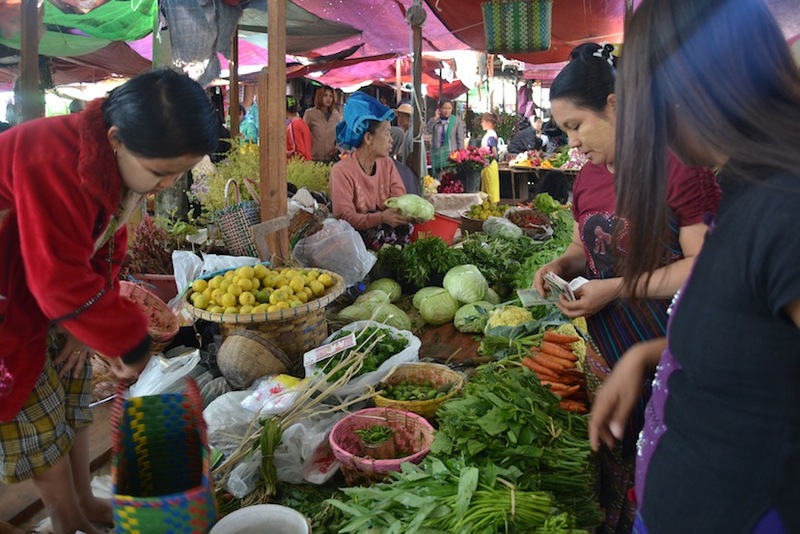 The market in Nyuang Shwe is pretty big and fishermen and farmers from around Inle lake come every day to sell their fresh goods. Stopping for shopping, tasting or just explaining what is what we spent here almost one hour. The food was delicious and we are already excited to try to make it ourselves! In the afternoon we stayed in to catch up with the online world at the hostel’s terrace. We were only ‘disturbed’ by loud music from amplifiers, drums and people singing. A long procession was about to pass our guesthouse and so we ran down to watch. 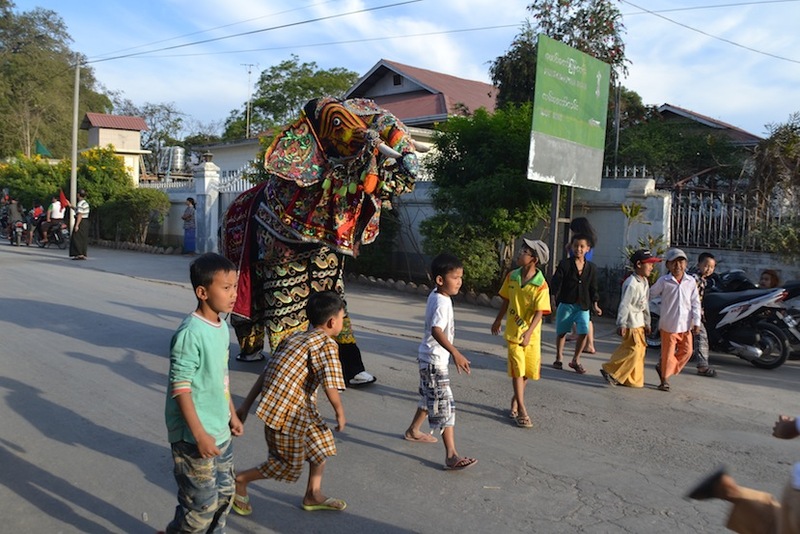 At first two men dressed in a dancing elephant costume were being followed by many small children. 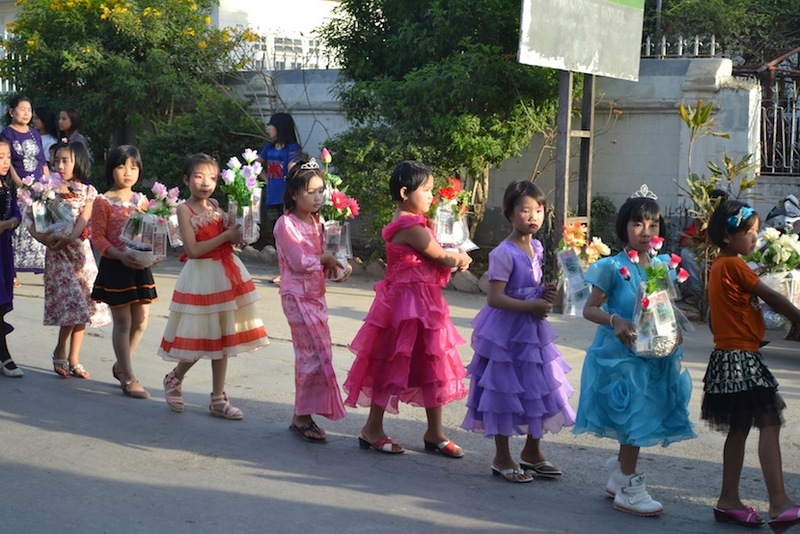 Next a long line of ladies from almost babies to old women dressed in festive colorful clothes followed carrying flowers decorated with banknotes. After this line a man dressed as a woman with heavy make up danced his way forward accompanied by his male partner. Men on tricycles, men playing drums, dancing or just walking followed. The celebrated ones came last; 2 young kids beautifully dressed and wearing heavy make-up were swinging their arms to the music on horsebacks with men holding long traditional umbrellas above them. It wasn’t easy to tell if they were boys or girls. Staff in our guesthouse told us that this procession is a monk novice initiation and the 2 kids are being escorted this way to a monastery which will be their new home now. 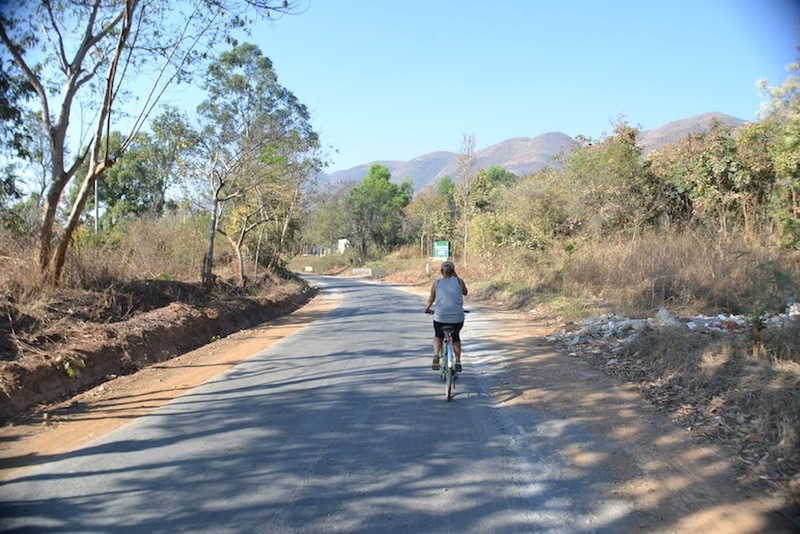 On the next day we decided to explore the area around the lake, we rented bicycles and started before it got too hot. Our guesthouse (as well as some blogs we found) had a nice bike route on their board and so we followed. We crossed the busy morning town and headed to the west of the lake. After a bit of dustpath a paved road lead us through fields, watergardens and villages. We climbed up to a pagoda to get a view, passed a hot spring resort and got to the last village before we would cross the lake with our bikes on a boat. ‘Mingalabar’ – ‘hello’ in Myanmar language followed us everywhere: at a monastery built on stilts on the water, at a pagoda where we had some green tea with local women, in the village where we saw meats and seeds being sun-dried on large mats, from women making various kinds of tofu and a family doing their laundry at a communal well. Not so welcoming was a couple of small boys shooting at us with small stones as we entered their territory :). After a short beer break at one of the temples we got on a boat and crossed the lake watching fishermen on their boats skillfully paddling with their legs and maneuvering the traditional fishing nets. Birds were fishing too and other boats passengers where, again, waving at us from far. The other side of the lake has more fields and less trees so around noon the heat was really getting to us. Frequent stops for water or coke were necessary. One such stop brought us to a local school grounds where a performance just started. 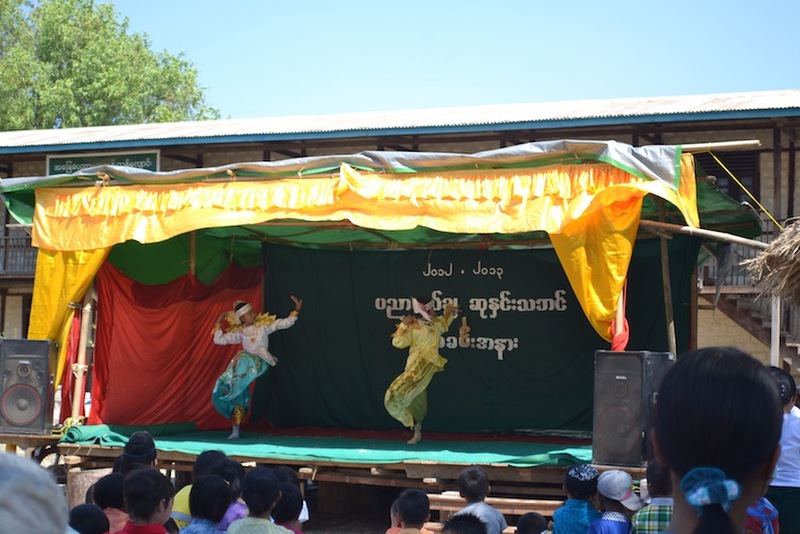 On a small stage we watched kids dance in traditional costumes, a girl dancing to a burmese cover version of a western song and 5 6-year old boys performing a fashion show. 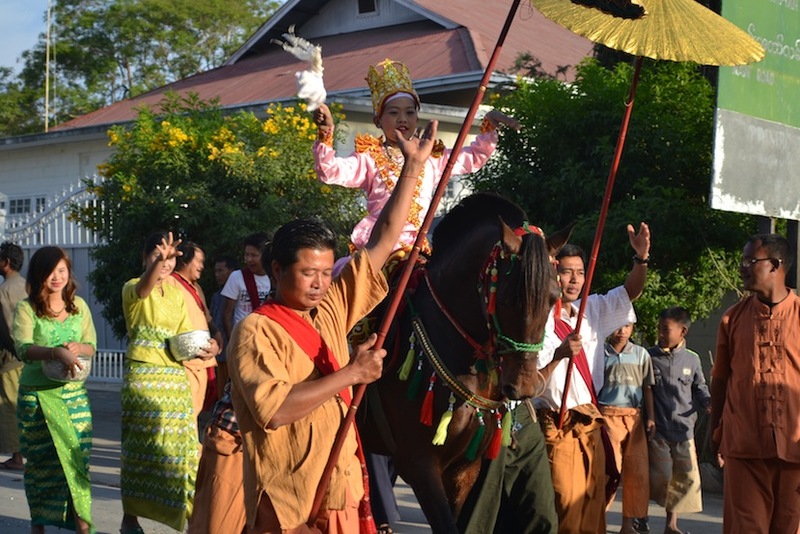 Every day in Myanmar we saw a performance or celebration of some kind. We finished our day at a french bakery in town still in need of our dose of western food. One more time we rented bicycles to ride to a vineyard on a hill next to the lake and watch the sunset. 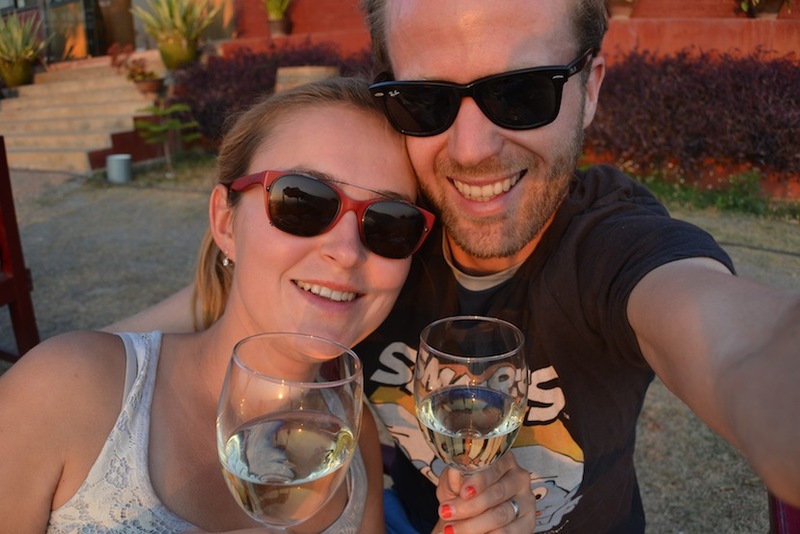 Red Mountain vineyard is the only place in Myanmar where we saw grapes and tasted wine. We started with a tasting set of four glasses. Not expecting much from south-east asian wines we were very much surprised! The wine was not sweet as they usually are here and we quickly found our favourite of which we ordered a few more glasses. The ride back was fun! We spent a couple of more days in the town just relaxing or walking around. After 5 nights we booked a bus ticket to Bagan. 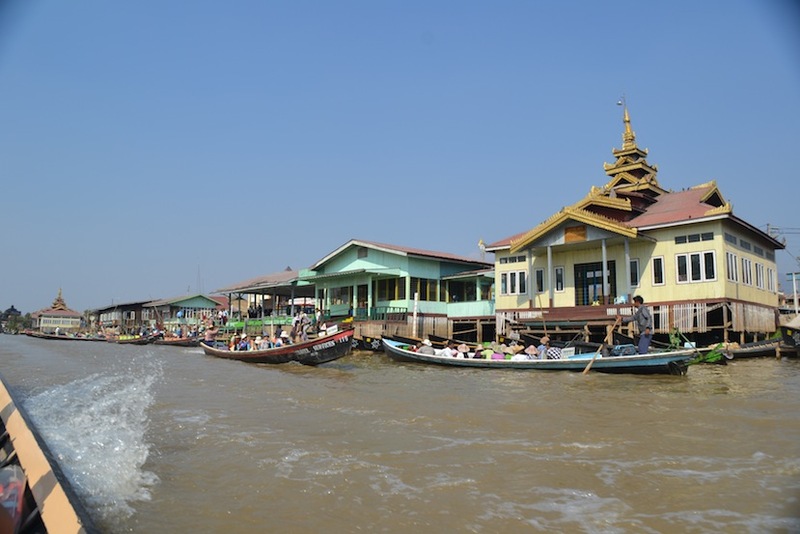 Take a look at the best pictures from Inle lake in our Google plus album. 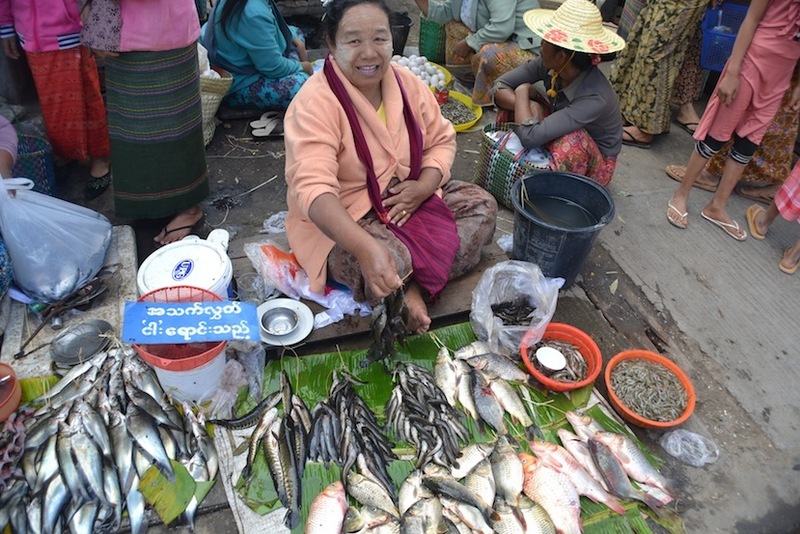 Kazdy, kto navstivi Myanmar by nemal vynechat jazero Inle Lake. Napriek tomu, ze je to jedno z najrusnejsich turistickych miest v krajine, my sme tu stravili 5 velmi pohodovych dni. Nasou volbou pre ubytovanie, podobne ako pre ostatnych cestovatelov, bolo mesto Nyuang Shwe. Ako sme sa utvrdili aj pocas nasich vyletov okolo jazera, toto mesto je vlastne aj jedinou volbou pre backpackerov. Pred trojdnovou turou k jazeru sme si zarezervovali izbu v hosteli, ktory ma prve miesto na tripadvisore – Mingalar Inn – a nesklamal. Okrem inych pozitiv, zamestnanci nas kazdy den naseho pobytu vitali welcome drinkom! Tomu hovorime pohostinnost! Po siestich mesiacoch na cestach v tak odlisnych krajinach sa nam niekedy zacnie za zapadnym jedlom. Nastastie, ponuka v mestecku bola dobra a bolo tu niekolko restauracii s pizzou a cestovinami a aj francuzska pekarna. Pizza bola nasim cielom v prvy den. Potesilo nas aj to, ze vela myanmarskych restauracii ponukalo lokalne salaty a tak sme vyskusali aspon jeden kazdy den. Nasim najoblubenejsim bol avokadovy salat. Salat samotny bol celkom jednoduchy, ale myanmarske avokada stoja za uspechom – najlepsie avokada ake sme kedy mali. Uz ste hladni? Tak vas este trochu navnadime. V agenture, kde sme si nechali vyprat oblecenie, sme na nastenke vzhliadli inzerat na kurzy varenia. Skvele, videli sme pred sebou sancu na splnenie jedneho z nasich predsavzati a zaroven sa naucit varit jedlo, ktore vela ludi este neochutnalo. Ucitelka / kucharka mala v plane cestu do Yangonu na druhy den vecer a tak nasou jedinou sancou bol ranajsi kurz. Doobedie stravime varenim a co si navarime zjeme na obed. Thu Zar – kucharka – nas vyzdvihla rano o 9 priamo v hosteli. Prekvapilo nas, ked sme uvideli vo dverach mladu babu s celkom dobrou anglictinou. Cestou k miestnej trznici nam vysvetlila, ze spolu pripravime 9 pokrmov, ale najprv si musime nakupit ingrediencie. Trh v Nyuang Shwe je celkom velky a kazdy den hosti rybarov a farmarov z celeho okolia jazera. Zastavovali sme sa pri stankoch, kde sme bud nakupovali, alebo len ochutnavali a nechali si vysvetlit co je co a na co sa to pouziva. Takto nam presla skoro cela hodina. Vsetky jedla boli vynikajuce, dobre sme si pochutnali a uz sa nevieme dockat, kedy vyskusame recepty v nasej kuchyni. Poobede sme ostali v hosteli a trochu internetovali na terase. V podvecer nas ‘vyrusil’ hluk pozostavajuci z hlasnej hudby z reproduktorov, bubnov a spevu. Nasou ulicou prechadzal dlhy sprievod, ktory sa blizil k nasemu hostelu a tak sme zbehli dolu, aby sme sa pozreli blizsie. Ako prvi sa objavili dvaja muzi tancujuci v kostyme slona, okolo ktorych pobehovali deti. Po slonovi nasledoval dlhy zastup zien – od malickych deti az po stare damy – oblecenych v slavnostnych farebnych satach nesucich kvetiny ozdobene bankovkami. Po nich sa objavil muz s mejkapom prezleceny za zenu tancujuci s partnerom. Dalej muzi na trojkolkach, kracajuci, tancujuci ci bubnujuci. Hlavni oslavenci prisli az na zaver: 2 deti na konoch oblecene v krasnych satach s hrubym mejkapom mavali rukami do rytmu hudby zatialco muzi nad nimi drzali tradicne papierove dazdniky. Chlapi z hostelu nam povedali, ze tento sprievod je akesi uvedenie mladych mnichov a tie 2 deti na konci budu takto odprevadene az do klastora, ktory bude ich novym domovom. Na druhy den sme sa rozhodli preskumat okolie jazera, pozicali si bicykle a vydali sa na cestu skoro rano, predtym nez slnko zacalo piect. V hosteli (a aj na par blogoch) sme zasli zaujimavu trat okolo jazera. Cez ranne ruzne mesto sme si to namierili na zapad. Po chvili jazdy na prasnej ceste sme boli radi, ked sme sa dostali na asfaltku, ktora nas viedla cez okolite polia, plavajuce zahrady a dedinky. Vyliezli sme na kopec k pagode, kde sa nam naskytol vyhlad na jazero, presli popri termalnom prameni a bicyklovali az do poslednej dedinky, kde sa prechadza lodou na druhu stranu jazera. ‘Mingalabar’ – myanmarske ‘dobry den’ nas sprevadzalo vsade, kam sme isli: v klastore postavenom na vode, pri pagode, kde sme boli pozvani na salku zeleneho caju miestnymi zenami, v dedinke, kde miestni susili maso a semienka na slnku na slamenych podlozkach, od zien, ktore vyrabali tofu a od rodiny, ktora prala pri komunalnej studni. Jedini, od koho sa nam nedostalo uvitania, boli dvaja mali chlapci, ktori na nas strielali kamienkami z praku. Azda sme vstupili do ich teritoria :). Po pivkovej pauzicke pri chrame sme sa aj s bicyklami nalodili na dlhu lod. Cestou na druhu stranu sme videli rybarov, ako sikovne padluju drziac veslo nohou, zatialco po stojacky manevruju tradicnymi rybarskymi sietmi. Vtaky tiez rybarcili a pasazieri v okoloiducich lodiach, ako inak, na nas pozdravne mavali. Na druhej strane jazera je ovela viac poli a tak i menej stromov, ktore poskytuju vzacny tien. Okrem toho uz bolo okolo poludnia, a tak vdaka horucave sme si robili caste prestavky na doplnenie tekutin. Jedna takato prestavka nas zaviedla k miestnej skole, kde zrovna zacinalo vystupenie. Ma malom javisku sme mali moznost vidiet deti tancovat v tradicnych kostymoch, dievcatko tancovat do rytmov zapadnej pesnicky prespievanej po myanmarsky a 5 sestrocnych chlapcov, ktori divakom pripravili modnu prehliadku. Kazdy den v Myanmare sme videli taku ci onaku slavnost. Den sme zakoncili dalsou davkou zapadneho jedla vo francuzskej pekarni. Este raz sme si pozicali bicykle, aby sme sa dostali na vinohrad na kopci nad jazerom a uzili si zapad slnka. Red Mountain vinohrad je jedinym miestom v Myanmare, kde sme videli rast hrozno a ochutnali vino. Na uvod sme si objednali ochutnavkovy set styroch vin. Neocakavali sme od toho moc, a tak sme boli velmi milo prekvapeni, ze existuju i dobre vina z juhovychodnej azie. Narozdiel od inych, toto vino vobec nebolo sladke ako sirup a tak sme si rychlo nasli to oblubene, z ktoreho sme si este objednali par poharikov. Cesta na bicykli naspat bola parada! Dalsie dni v meste sme stravili len vegetenim a prechadzkami. Po piatich nociach sme si zarezervovali listok na autobus, ktory nas odvezie do Baganu. Pozrite si najlepsie fotky z jazera Inle Lake v nasom Google plus albume.